When you are looking for a safe, power efficient and high performance machine you can’t go past the Transtig 170Ti with MineSpec safety features and High Frequency start in TIG mode. Safety and Efficiency - getting home at the end of the day is what it’s all about. With operator protection being paramount the 170Ti is packed full of safety features including VRD that conforms to AS 1674.2, Fail to Safe and an insulated plastic housing that is IP23S rated. The Transtig 170Ti is also a Mine Spec inverter, making it ideal for those welding in confined spaces specifically in construction and maintenance on mining sites. This unit comes with a braided and reinforced supply lead that virtually eliminates electric shock from a damaged power cord. This model also comes standard with a heavy duty, IP66 rated and compliant 15A supply plug, which screws into place and forms a weather proof seal against damp, dirt and grime. Another safety advantage is the stick electrode holder with Deadman Switch which ensures that voltage at the electrode before you start is ZERO VOLTS. Voltage then increases to 8V DC (VRD on) when the Operator presses the Deadman switch to start welding. In addition to your safety, weld performance is also essential, so when you’re looking for better weld quality without contaminating your TIG tungsten electrode, the 170Ti with high frequency start feature raises the bar. You’ll get a more positive arc start at a lower amperage setting – one that starts first time. So there’ll be no more scratch starting making this unit ideal for pipe work and other DC TIG welding applications. With Stick (MMAW), Lift TIG (GTAW) and HF TIG (GTAW), this robust unit specifically has the mining industry in mind, making it ideal for those welding in confined spaces in the construction and maintenance of mining sites. In addition to mining, the 170Ti is also suitable for a range of other industries; construction, general maintenance, building, on-site repair, pipework, DC TIG and Stick applications. The 170Ti is also suitable for all electrode types including cellulose. 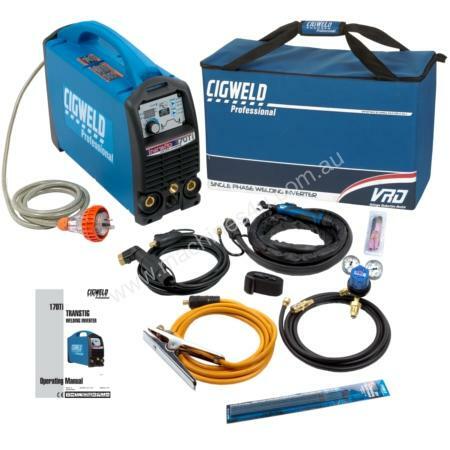 At a shade over 11.5kg, you can throw one of these over your shoulder or in the back of the ute and get straight on with the job So wherever you weld, whatever your industry … … with a Transtig 170Ti from CIGWELD, you know that you and your contractors can finish a quality job and head home safe at the end of the day. Visit our website to buy online or download the brochure.